Walt Disney had a knack for recognizing talent, and he saw a lot in his new star, Hayley Mills, who made a name for herself as the star of Pollyanna. He was in search of a project to showcase her talents when story man Bill Dover approached Walt with a book he found in Germany called Lisa and Lottie by Erich Kastner, about two children who discover they are sisters separated at birth by quarreling parents. Working titles included "We Belong Together," "Petticoats and Blue Jeans" and "His & Hers" before Walt picked The Parent Trap. The story was adapted to the screen by writer/director David Swift. David Swift was also the writer/director of Pollyanna. The parents are played by Brian Keith, who was primarily known as an action star and was in Disney's Ten Who Dared, and Maureen O'Hara in her one and only Disney film. The film was shot both on location and at the studio. An exterior of the dad's house was built on Disney's Golden Oak Ranch. However some scenes outside the home were filmed at millionaire Stuyvesant Fish's ranch in Carmel. Almost all of the interior set were built within the Walt Disney Studios in Burbank. Ub Iwerks invented many of the techniques used to allow Hayley Mills to play both Sharon and Susan. Effects included split screen, sodium traveling matte and the most simple of which, using a double who simply doesn't show her face during the shot. The filmmakers were worried about how convincing the effects would be and were delighted as the dailys came in to find that they worked. Walt insisted on adding music to the film and used his newest addition to the studio, The Sherman Brothers. They had previously only written one song for the studio, "The Medfield Fight Song" in The Absent-Minded Professor. However they were the songwriting duo behind many of Annette Funicello's hit songs, which were released on Disney's Buena Vista Records. They wrote three songs for this film: "The Parent Trap," "For Now For Always" and "Let's Get Together." The title song was sung by Annette Funicello and Tommy Sands, who were both working together on Babes in Toyland at the time. Annette also sings a version of "Let's Get Together" that is played during the dance sequence at the camp. Hayley Mills was reluctant about singing because she did not consider herself a singer. The film opens with an entertaining stop-motion sequence depicting two girls trying to reunite their parents. From there we are introduced to Sharon and Susan, two girls from opposite ends of the country who meet at summer camp and look identical. They immediately dislike each other and get in a big fight, resulting in the counselors isolating them to their own cabin. Forced to get along, they discover that they share the same birthday and parents, so they decide to switch places so the other can meet the parent they never knew. Susan goes to Boston to meet her mother and Sharon goes to California to meet her father. Their plan was to eventually tell the parents and reunite them, but this is sullied by the fact that over the summer, the dad proposed to a younger woman named Vicky. Sharon soon discovers that his fiance is really only after his money and after a plea for help to Susan, she returns to California with their mother. The twins decide to not tell their parents who is who until they all go on a camping trip together. When Vicky intervenes and invites herself along, the mother ducks out at the last minute and the girls play a series of jokes on their future step mom, forcing her to reveal her true intentions. Upon returning home without Vicky, their father realizes he never stopped loving their mother and the two rekindle their romance. The film ends with the girls dreaming of their parents inevitable wedding. The Parent Trap premiered on June 12th, 1961 and opened to the general public on June 21st. Critics were mostly positive towards the film and nearly all of them attributed its success to Hayley's performances. The complaints seemed unanimous that its run time was too long (2 hours and 4 minutes) and the plot too predictable. However, audiences didn't seem to mind either and the film was a huge box office success. It proved that Hayley Mills was one of the studio's most bankable stars and that audiences had come to trust Walt Disney when it came to live action comedies (his previous efforts being The Shaggy Dog, Pollyanna and The Absent-Minded Professor). The film did well enough to be rereleased theatrically in 1968. It made its home video debut in 1984. It was nominated for two Academy Awards for editing and sound. 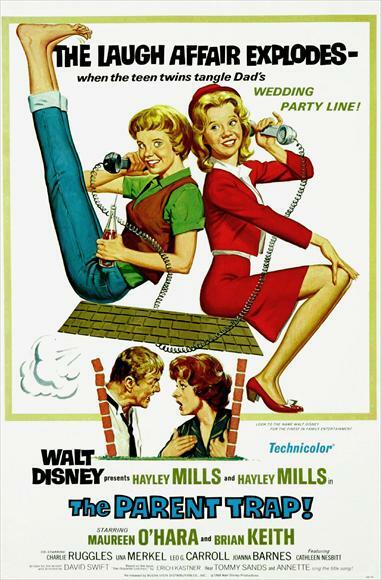 It was also nominated for two Golden Globes for best comedy and best actress in a musical/comedy for Hayley Mills. The soundtrack was nominated for a Grammy. I first saw The Parent Trap as a child on The Disney Channel. I remember being sucked in by the fascinating opening credit sequence and while the plot was definitely more mature than I could relate to at the time, I never got bored with it. Over the years I have come to appreciate it even more and looking at it through an adult's eyes, it's easy to see just how brilliant and special this film truly is. It plays entertaining levels for both children and adults. Some of the most memorable scenes include "Let's Get Together" and the girls' antics at summer camp. But as an adult, some of the most entertaining scenes are when the reverend is at the house to discuss the marriage and takes great delight at the situation when he finds that the groom's ex wife has shown up unannounced. And the scene where the parents realize they still love each other is touching and gets me misty eyed. The film has had a surprising legacy for the Disney Company over the years. Three television sequels were made in the 80's: The Parent Trap II in 1986, Parent Trap III and Parent Trap Hawaiian Honeymoon both in 1989. All three sequels starred Hayley Mills reprising her dual roles as an adult, with Sharon and Susan having their own marriage troubles. The success of "Let's Get Together" as a radio hit inspired a full album from Hayley Mills. A fantastic remake was done in 1998 starring Natasha Richardson and Dennis Quaid as the parents and introducing Lindsay Lohan in her first film as the twins. Both versions of the film are great and while many fans prefer one over the other, I am unable to decide which I like more. The film is currently available on DVD in a fantastic 2-disc set, part of the Vault Disney collection. A great restoration has been done, although at times the image is blurry and could certainly be improved. The film is presented in a widescreen aspect ratio of 1.78:1. While the original theatrical aspect ratio was 1.75:1, this change is a barely noticeable difference and you are missing very little image from the top and bottom of the screen. Bonus features include a making-of documentary, audio commentary, original promotional material and conversations with the Sherman Brothers and Hayley Mills. The set was rereleased in 2005 and added 1986's The Parent Trap II to disc 1. While this was a welcome inclusion, the 2-movie set does suffer some from compressing two films onto the same disc. While the standalone release is now out of print, copies can still be found at a decent price. If you are only interested in the original film, it is the option I recommend. The other two sequels have never been released in any home entertainment medium. It is also available on iTunes in widescreen, where it can be purchased in HD. However the digital copy doesn't include any of the fabulous extras. Help us fund a brand new documentary on the Legacy of Walt Disney's The Parent Trap featuring Hayley Mills. Also participating is Susan Henning, Joanne Barnes, Tommy Sands, Tom Skerritt, Carrie Heim, Patricia Richardson, Chris Gartin and more! China TV because of the upstream businesses have been not able to control panel. Learn about putlockerfreemovies on You click the ad, cover the dress and then the trouble starts. putlockerfreemovies.org has more information on Watch Full Movies For Free - PutLocker..